For the first time in a while, the top four teams in the NFL changed, with New England getting blown out in Tennessee and Pittsburgh giving Carolina their worst loss in some time. In a week where the games (on paper) were far less compelling than what transpired on the field, multiple underdogs won their games outright, shaking things up substantially throughout the rating system. Week 11 promises to be a fun week. 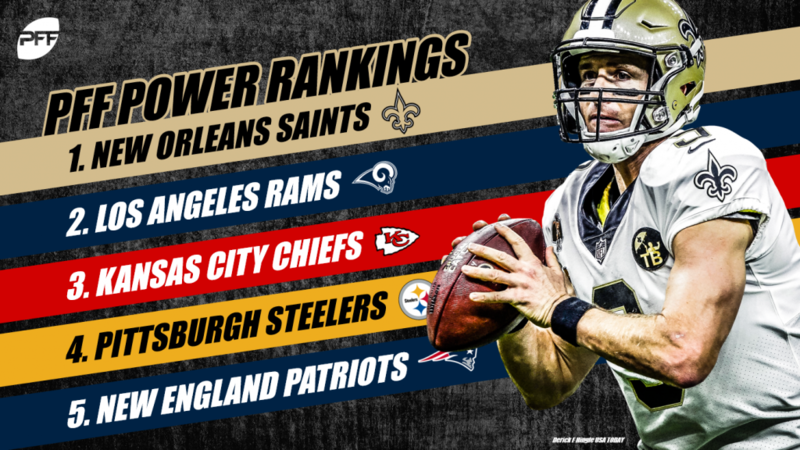 The Saints took care of business last week in Cincinnati, which was the trappiest of trap games sandwiched between home games against the Rams and the Eagles. Drew Brees has been a cluster 1 quarterback so far this season and an MVP candidate for a team that is second in the league in EPA generated in close games. The Seahawks gave them a game – again – but ultimately the Rams were able to overcome the Seahawks’ 200 rushing yards to move to 9-1 on the year and basically a 100% chance to win their division after 10 weeks. Their 15.1% chance to win the Super Bowl is third behind the Saints and the Chiefs, odds that are likely to climb if they can win their away-home turned home-home game this week. The Chiefs are the second-most likely team to win the Super Bowl through 10 weeks (17.4% chance). Patrick Mahomes is the rare example of a cluster 1 quarterback during his first season as a starter, generating 0.40 EPA per dropback while earning a negative grade on fewer than 8% of dropbacks. Rumors of their demise at 1-2-1 were greatly exaggerated. Randy Fichtner has been our highest-rated offensive play-caller through 10 weeks, making up for the fact that it has taken Ben Roethlisberger a lot longer to make his way to his normal quality of play this season. At 10/1, the Steelers are a pretty solid value to win the Super Bowl at this point. Classic Patriots. Slow start, big win streak, some random “wut?” game on the road mid-to-late season and a winning streak to close the season. No team’s Super Bowl odds dropped more than the Patriots last week, and Tom Brady continues to struggle (by his standards) at times, but this is more likely a blip than anything real moving forward. This is the quietest 7-2 team in recent NFL history. 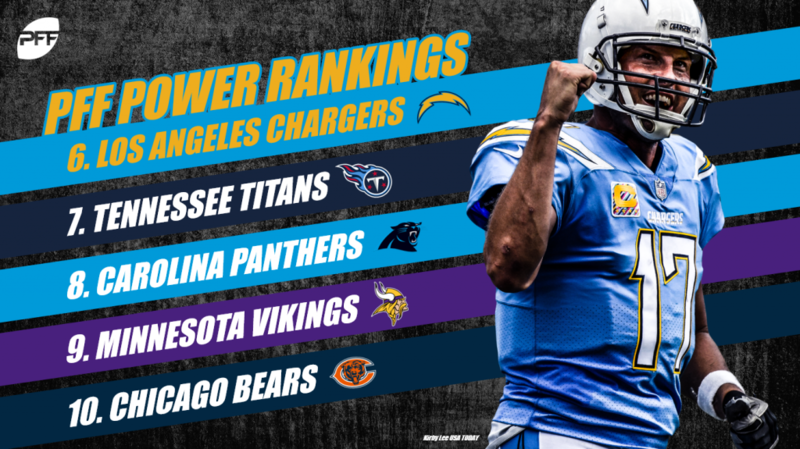 The only elite team with a top-five defense in terms of EPA allowed per play; the Bolts also sport a cluster 1 quarterback in Philip Rivers. Fewer than 10% of Rivers’ throws have been negatively graded, while almost 5% have been labeled “big-time.” In a division that has largely been the Chiefs’, Los Angeles still has a chance to be the one seed in the AFC, and if they were to be it’s hard to argue that they wouldn’t be the favorite in the AFC. This is the best team in the AFC South, and while they are only about 40% to win the division, they are the clear favorites at over 55% to take the last playoff spot in the AFC for the second consecutive year. As it stands now, that would earn them another date with the Patriots, who they dismantled last week. The Panthers came back to earth last Thursday against the Steelers, surrendering 52 points and failing to generate the offensive efficiency that got them to 6-2. Despite something of a career renaissance, Cam Newton has more turnover-worthy plays than big-time throws through nine games. His pick-six against Pittsburgh put them squarely behind the eight ball, and for a frontrunner-like team like Carolina, giving scores to the other team will be a way by which they leave the playoffs early come January. As three-point underdogs in Chicago this weekend, the market is essentially saying that the Vikings are about the same as the Bears on a neutral field. We largely reject this, since the Bears have played the league’s easiest schedule so far this year, while Kirk Cousins, save for a few really bad turnovers, has graded very well this season. The Vikings defense is second to the Bears so far in EPA allowed per play in close games. Take the QB. Speaking of the Bears, here they are. Mitchell Trubisky put together his second good game of the season Sunday but is still in way over his skies in terms of the PFF/EPA generated on dropbacks curve. Matt Nagy has been a top-5 offensive play caller so far this year, but Mike Zimmer has been the top guy in terms of defensive play callers, so buckle up for a big test for the Trube Sunday night in Solder. Woof. The Eagles haven’t played an impressive game on a Sunday this year, and that’s unlikely to change on Sunday in New Orleans. Carson Wentz has quietly been a cluster 1 quarterback, whose percentage of negatively-graded throws (a quarterback’s most-stable trait) is among the league’s best. With their top three cornerbacks all hobbled at this point, it’s likely the Saints will be able to pick the score Sunday, putting the then 4-6 Eagles even further behind the eight ball in the NFC East. Woof 2x. 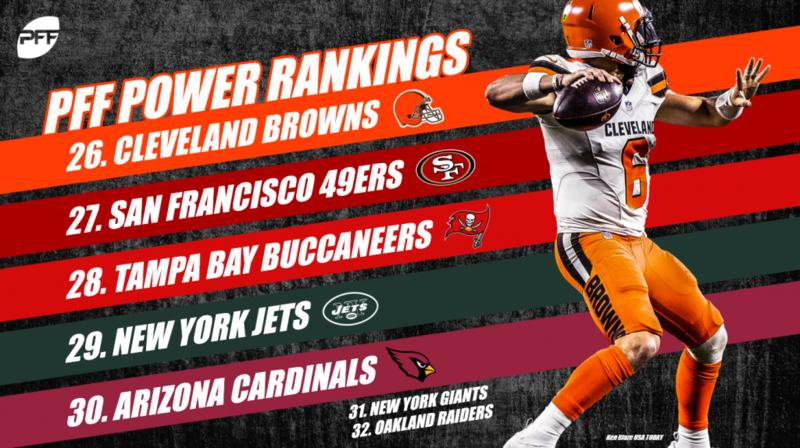 The PFFalcons were one of the few lowlights for PFF Greenline last week, failing to win outright as a touchdown-ish favorite against the Cleveland Browns. Their defense is the worst in the league in terms of EPA allowed in close games, putting their playoff odds at under 30% at this point, even in a weaker-than-expected NFC. The Seahawks had another plucky effort on Sunday against the Rams. Russell Wilson, who has got more help from the offensive line and the running game, has played very well this year – generating a big-time throw on over 8% of his dropbacks so far this year. We have them with almost a one-in-four chance of making the playoffs at this point, which will be significantly increased if they can win Thursday at home against Green Bay. Is a new era about to begin in Baltimore? With rumors of John Harbaugh leaving after the season and Joe Flacco possibly missing starts through injury, what started as a promising season for the birds is now looking like the beginning of a rebuild. They’ve played the fourth-toughest schedule in the league through 10 weeks, a trend which eases up the rest of the way. That said, they are a long shot to make the playoffs at under 20% moving forward. The other team that plays in Maryland, however, is alive and well. Despite the flukiness that was their game in Tampa Bay, the breadsticks are 6-3 and have a commanding two-game lead in the NFC East. 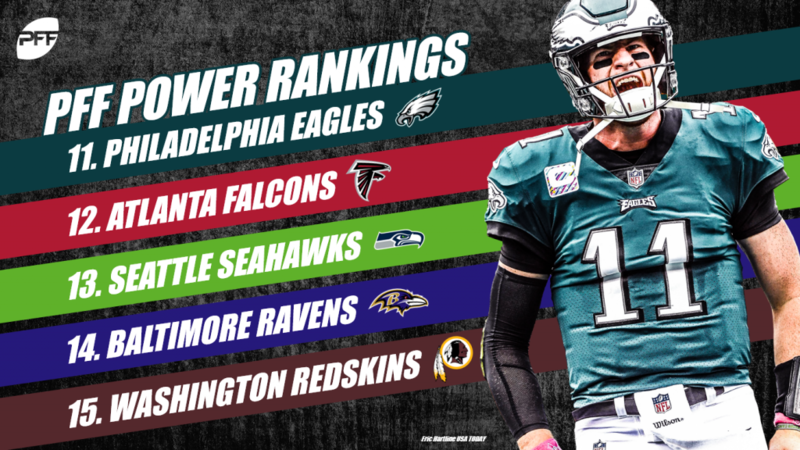 They have the 17th-most difficult schedule moving forward, whereas Philly has the ninth-toughest and Dallas has the sixth-toughest, so look for Alex Smith, Jay Gruden and company to hold onto this surprise season in the nation’s capital. Aaron Rodgers had graded like an MVP candidate, earning a cluster 1 tag through the season’s first 10 weeks. That said, the Packers’ offense has generated just 0.09 EPA per dropback on his dropbacks, versus 0.33 for Drew Brees, 0.40 for Patrick Mahomes, 0.28 for Jared Goff and 0.29 for Philip Rivers. 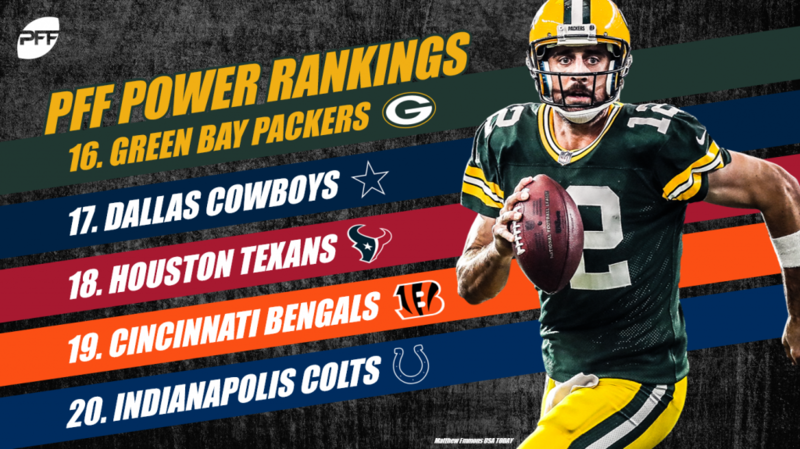 With one hand tied behind his back, it’s going to be difficult for the Packers to win back the NFC North, a proposition that we have as about one in 20. The Cowboys kept their hopes of a division title alive with a convincing road win against the Eagles on Sunday night. Zeke averaged 6.16 yards after contact, the third-highest mark for any running back with at least 15 carries in a week. With an EPA per dropback of -0.07, Dak Prescott will have to perform better down the stretch if the Cowboys want to sneak into the playoff picture. The Texans received a much-needed rest week as they head down the final stretch with the hope of securing the AFC South crown. Our model gives them just over a 60% chance of winning the AFC South and a 68% chance of securing a playoff berth. Deandre Hopkins continues to be outstanding and has posted a 1.46 WAR to go along with a 64.0% catch rate on contested passes. After starting the season 4-1, the Bengals have now dropped three of their last four games and are in serious doubt of missing the playoffs. Andy Dalton had by far his worst passing game of 2018 with no A.J. Green in the mix. He will need to return to his early season form where he generated over 3 WAR if the Bengals want any shot of staying in the playoff chase. The Colts head into a showdown with the Titans on Sunday in a game they must win if they want to keep their slim division hopes alive. Andrew Luck has put together three straight games where he has averaged an EPA per dropback over 0.50. Luck hasn’t been sacked over this timeframe and has thrown only one interception along with one turnover-worthy throw. If the Colts find a way to win on Sunday, their odds of making the playoffs (14%) and winning the division (8.7%) will increase significantly. 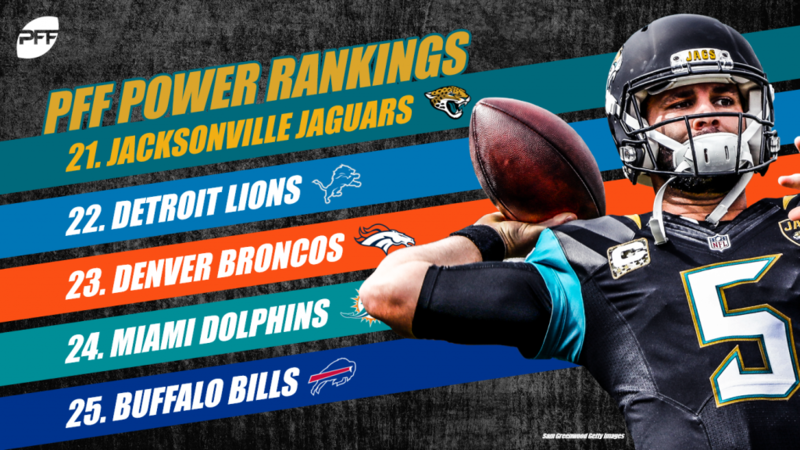 The Jaguars are in full on freefall mode and have stumbled to a 3-6 record after dropping their last five games. Blake Bortles had one of his best games of 2018 and should not be shouldering much of the blame for the Jaguars’ disastrous season. When starting Bortles, the expectation has to be league average quarterback play, but Bortles has performed slightly better than that, posting a WAR of 1.3. Matt Patricia’s defense made Mitchell Trubisky look like the second coming of Drew Brees on Sunday. To say they missed the coverage ability of Darius Slay would be an understatement, but they have struggled in coverage all season. The Lions defense has faced the highest average depth of throw in the league at 9.5 yards. Outside of Tampa Bay, they have allowed the highest passer rating in the NFL. Case Keenum isn’t the quarterback he flashed at points in 2017. With a higher percentage of turnover-worthy throws to big-time throws, Keenum isn’t getting the same help from his receivers as he got in 2017. On contested throws, Keenum had a 54% completion percentage in 2017, in 2018 that number has dropped to 23%. If you want a direct reference for how valuable quality receiver play can be for a quarterback, look no further than Keenum’s splits from 2017 to 2018. Brocktober has carried over into November with the same disastrous results one should have expected. At 5-5, the Dolphins have had one of the more perplexing seasons in 2018. With three of their wins coming against the Jets and Raiders and two matchups still looming against the Bills, the Dolphins have an outside chance of making the playoffs at around 17%. LeSean McCoy, former generational talent, showed why he belongs in the Bills’ plans by finally getting over the 100-yard mark. His Week 10 average of 2.54 yards after contact per attempt boosted his season average to 1.88. Matt Barkley posted the highest single-game passer rating of any Bills quarterback in 2018. His EPA per dropback of 0.07 was only the second game in which a Bills quarterback has generated a positive EPA on dropbacks. Baker Mayfield felt dangerous on Sunday, as the Browns executed a near perfect game plan and flashed their blueprint for success moving forward. Mayfield was nearly perfect, completing 85% of his attempts for a passer rating of 151.3 and he also generated almost a full point of EPA per dropback. The ‘free Nick Chubb movement’ has been a rousing success, as he has picked up 5.28 yards after contact per attempt in Week 10, by far the best mark in the of the week. Nick Mullens was knocked back down to earth in his second start for the 49ers. This team has been decimated with injuries but has flashed a few bright spots in an otherwise lost season. George Kittle is emerging as the best up-and-coming tight end in the NFL, posting the highest receiving grade in the NFL among qualifying tight ends. Defensively, DeForest Buckner and Arik Armstead have combined for 62 total pressures, and in his eighth NFL season, Richard Sherman continues to elevate his coverage play and has allowed a passer rating of only 66.8 on throws into his coverage. In one of the more impressive feats of 2018, Ryan Fitzpatrick threw for 406 yards yet somehow scored only three total points. The only reason Jameis Winston should not be receiving snaps at this point is if the Bucs are 100% convinced he will not be on their roster in 2019. The injury concerns and being on the hook for 20 million are valid arguments, but from an information gathering perspective, it simply doesn’t make sense to continue starting a journeyman quarterback when a former #1 overall pick (who has flashed at certain points in his career) is rotting away on the bench. Not much can be gleaned from the Jets performance against the Bills on Sunday. In a matchup of two bad teams who both played backup quarterbacks, the Jets were clearly worse in a blowout loss at home. Todd Bowles may have the hottest seat in the NFL right now. He does not have the pedigree to develop Sam Darnold into a quality NFL quarterback and could be looking for a defensive coordinator position come 2019. The Cardinals played tough on the road and held close against the Kansas City Chiefs. Josh Rosen has taken his lumps in year one, having the highest percent of dropbacks resulting in a quarterback hit and he has also been pressured on 42% of dropbacks, which is the fourth-highest mark in the NFL. Upgrading this offensive line should be priority number one for the Cardinals in the offseason. Eli Manning turned back the clock for one night and led his Giants to a come from behind victory over third-string quarterback Nick Mullens and the injury-ravaged 49ers. PFF Greenline thanks Eli for his performance in an otherwise disastrous season. Odell Beckham Jr. is still one of the perennially great receivers in the NFL and should ease the learning curve for the Giants new quarterback in 2019.